CONTEXT: Mortality due to noncommunicable diseases (NCDs) has increased worldwide and, according to the World Health Organization report in 2012, 68% of mortality was due to NCDs. In India, deaths due to NCDs in 2008 were 5.3 million. A rapid health transition is being experienced in India with a rising burden of NCDs. The first point of contact of patients with health services is primary health-care (PHC) facilities, which are the most appropriate places for patient screening and early detection. The National Programme for Prevention and Control of Cancer, Diabetes, Cardiovascular diseases and Stroke (NPCDCS) was launched in 2010 in India and in Belagavi district on September 29, 2015. Periodic evaluation helps to understand the problems a program is facing in managing and implementing so that appropriate modifications can be suggested. AIMS: To assess the implementation of NPCDCS at subcenters of Belagavi taluka. SETTINGS AND DESIGN: A cross-sectional study was conducted in Belagavi taluka of Belagavi district, Karnataka, from January 1, 2017, to December 31, 2017. SUBJECTS AND METHODS: The list of PHC centers and subcenters was obtained from the District Health Office, Belagavi. Simple random sampling method was used, and three subcenters from each of the 12 PHCs in Belagavi taluka were selected, accounting to 36 subcenters. Permission from the medical officer at the PHC was obtained, the concerned auxiliary nurse midwives (ANMs) of the selected subcenters in Belagavi taluka were contacted, written informed consent was obtained from all the participants, and the data were collected using a pretested, predesigned structured questionnaire based on personal interview by the investigator. STATISTICAL ANALYSIS USED: Rates, ratios, and percentages were calculated. RESULTS: The selected 36 subcenters in Belagavi taluka covered a population of 248,753, with a mean subcenter population of 6909. Nearly 63% of the subcenters were conducting the NCD camps weekly, with average number of NCD camps conducted per subcenter being 30/year, and the population screened for NCDs across all 36 subcenters was 64,096 accounting to 25.77% coverage. The prevalence of diabetes was found to be 4.87%, and the prevalence of hypertension was found to be 4.99% and, among the screened population, 69% of the ANMs had received training regarding NPCDCS and all the necessary equipment were adequate except for referral cards. CONCLUSIONS: NCD screening camps were being conducted at all subcenters and only 69% of ANMs had received training for NPCDCS and the necessary equipment and Information, Education and Communication materials were available at all selected subcenters for conduction of NCD camps. Deaths due to noncommunicable diseases (NCDs) have increased worldwide since 2000 AD and, according to World Health Organization (WHO) in 2012, 56 million deaths occurred worldwide, of which 38 million (68%) were due to NCDs and three-fourth of these deaths (28 million) occurred in low- and middle-income countries. Estimated deaths due to NCDs in India in 2008 were 5.3 million. Prevalence per 1000 population of diabetes was 62.47, of hypertension was 159.46, of ischemic heart diseases was 37, and of stroke was 1.54. According to 2015–2016 National Family Health Survey-4 (NFHS-4), in India, 11% of women and 15% of men aged 15–49 years were hypertensive, and reading of random blood sugar (RBS) of more than 140 mg/dl was seen in 6% of women 8% of men. In Karnataka, 9.8% of women and 15.5% of men aged 15–49 years were found to have blood pressure (BP) reading of more than 140 mmHg systolic BP and more than 90 mmHg diastolic BP. Reading of RBS more than 140 mg/dl was seen in 9.5% of women and 12% of men. According to 2015–2016 NFHS-4, in Belagavi district, 9.3% of women and 10.6% of men aged 15–49 years were hypertensive, and reading of RBS more than 140 mg/dl was seen in 8.1% of women and 12.5% of men. The first point of contact of patients with health services are primary health–care (PHC) facilities, which are the most appropriate places for patient screening, early detection, provision for continuous care for uncomplicated patients, and patient referral to specialists. The existing health system in India needs reorganization, reorientation, and recruitment for expanded delivery of health care, focusing on prevention, surveillance, and management of chronic diseases, requiring sustainability of preventive interventions over the coming years for acute and chronic care of NCDs. Surveillance of NCDs along with their risk factors must be made an integral function of health systems. The Government of India had launched “The National Programme for Prevention and Control of Cancer, Diabetes, Cardiovascular diseases and Stroke” (NPCDCS) in 2010. In Karnataka, the program was implemented in phased manner from 2010 to 2016 covering 14 districts and it was launched in Belagavi district on September 29, 2015. The present study was undertaken for understanding the extent of implementation, management, and service utilization by beneficiaries, also addressing the difficulties faced by service providers and service utilizers in order to make necessary recommendations or modifications in the NPCDCS program, so as to bring in an effective service provision by health-care settings in the betterment of the community health in relation to NCDs in Belagavi district of Karnataka in India. To assess the implementation of NPCDCS at sub-centres of Belagavi taluka. Belagavi taluka has a population of 957,373 divided into urban (643,862) and rural Belagavi (313,511), as per the details availed from the District Health Office of Belagavi. There are 12 PHCs and 70 subcenters. Selected subcenters under each PHC in Belagavi Taluka. A facility based cross-sectional study. The study was conducted from January 1, 2017, to June 30, 2018 (18 months). Thirty-six subcenters, out of 70 subcenters, were included in the study by selecting three subcenters from each PHC by random sampling technique. Permission was obtained from the principal, Jawaharlal Nehru Medical College, KAHER, Belagavi. Ethical clearance was obtained from the Institutional Ethics Committee for Human Subject Research. A list of the details of PHCs and their subcenters of Belagavi taluka was obtained from the District Health Office of Belagavi. In the selected 36 subcenters, after informing the concerned PHC medical officer, the auxiliary nurse midwife (ANM)/male health worker (MHW) of the selected subcenters was interviewed by the investigator using a pretested, predesigned structured questionnaire based on the Operational Guidelines for NPCDCS (Revised 2013–2017) and Indian Public Health Standards (IPHS) guidelines for subcenters (Revised 2012) after obtaining written informed consent. In the subcenters, the concerned ANM is supposed to screen 40% of the target population, by screening individuals 30 years and above for diabetes and hypertension and by conducting NCD screening camps in their subcenters every week, preferably on Fridays to achieve the target, as told by the Belagavi district NPCDCS coordinators. The individuals were screened for diabetes by blood glucose strip method using glucometer and for hypertension using blood pressure (BP) apparatus, preferably mercury sphygmomanometer in sitting position and taking an average of three to four readings. The height in meters using stadiometer/measuring tape and weight in kilogram using adult weighing scale were recorded, and body mass index (BMI) was calculated. The individuals who were screened positive for diabetes or hypertension or both were referred to their respective PHCs for confirmation of the disease and initiation of the treatment. Irrespective of the disease outcome, the ANM counseled the individuals attending the NCD camps for health promotion by advising them for diet modification, physical activity, stress management, avoidance of tobacco and alcohol, and about the warning signs of cancer. In case of nonavailability of the PHC medical officer or the concerned subcenter staff, two repeat visits were made to the respective facility with prior intimation, and the data were collected by the investigator. During the visit, the investigator assessed the records and registers maintained by the ANMs at their respective subcenters and noted them. Neither physical examination nor laboratory investigations of the screened individuals were conducted by the investigator. The data collected using the questionnaire were coded and entered into Microsoft Excel sheet. Tables and charts were prepared. Rates, ratios, and percentages were calculated. 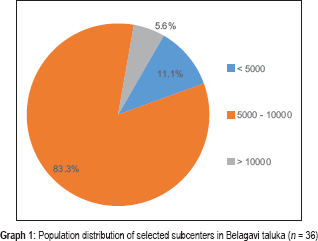 The selected 36 subcenters in Belagavi taluka covered a population of 248,753, with each subcenter covering a mean population of 6909 ± 1836.5 (range: 4471–13,868). Out of the 36 subcenters, 30 (83.33%) subcenters covered a population in the range of 5000–10,000 followed by subcenters covering a population of <5000, which were four (11.11%) and two (5.56%) subcenters covered a population of more than 10,000 [Graph 1]. The implementation of the NPCDCS was 100% at all subcenters, and the health checkup camps for screening of individuals aged 30 years and above were conducted at all subcenters. The age criterion of 30 years and above was as per the operational guidelines of NPCDCS. Among the 36 respondents, 23 (63.89%) of them conducted NCD camps on a weekly basis, 11 (30.56%) of them on a monthly basis, and 2 (5.55%) of them conducted NCD camps randomly [Graph 2]. Though the camps were being conducted in the subcenters, the frequency varied and among the 36 subcenters, 13 (36.11%) conducted less than 20 camps per year, 9 (25%) of them conducted camps between a range of 30 and 40, 8 (22.22%) of them conducted camps more than 40 per year, and 6 (16.67%) of them between the range of 20 and 30 per year [Graph 3]. The total number of NCD camps conducted across all subcenters was 1076 in the past year, with a mean of 30 ± 14 (10–52) NCD camps conducted per subcenter per year. Out of the 36 selected subcenters, the total population above the age of 30 years screened across all subcenters in the preceding year was found to be 64,096 of the total 248,753, which was 25.77% of the total population screened, with a mean of 1780 ± 749 population screened in the last year per subcenter. Out of the 36 subcenters, 13 (36.11%) of them screened about 20%–30% of population, 10 (27.78%) of them screened 10%–20% of the population, 7 (19.44%) of them screened more than 40% of the population, while 4 (11.11%) of them screened around 30%–40% of the population and 2 (5.56%) of the subcenters screened less than 10% of the population [Graph 4]. Out of the 64,096 individuals screened across all the 36 subcenters, 1608 of them were screened positive for diabetes, with the prevalence of diabetes only being 2.51%. The 1680 individuals of 64,096 were screened positive for hypertension, with the prevalence of hypertension only being 2.62%. 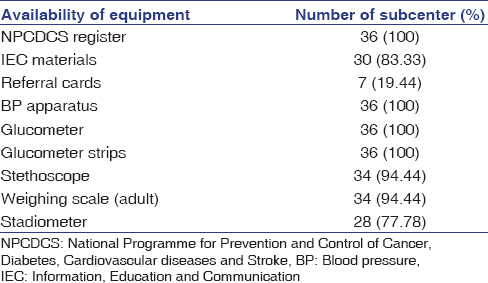 A total of 1516 individuals were screened positive for both diabetes and hypertension, with the prevalence of diabetes and hypertension being 2.37% [Table 1]. Out of the 64,096 individuals screened at NCD camps across all the 36 subcenters in the preceding year, a total of 3124 individuals were screened positive for diabetes, with the prevalence of diabetes being 4.87%, and a total of 3196 individuals were screened positive for hypertension, with the prevalence of hypertension being 4.99%. Out of the 3124 individuals screened positive for diabetes across all subcenters, 1412 (45.20%) were newly diagnosed and, out of the 3196 individuals screened positive for hypertension, 1156 (36.17%) were newly diagnosed by the regular NCD camps conducted at the subcenters. Out of the total 64,096 individuals screened, 4804 were screened positive for diabetes, hypertension, or both and, among those 4804 screened positive individuals, 2564 (53.38%) were referred to their respective PHCs or higher centers for confirmation and further management of the disease. Out of the referred 2564 individuals, the ANMs had no written data across all the 36 subcenters, of those who got the confirmation of the diseases and were initiated on treatment, while they orally said that during the interview many patients returned to further camps to inform about their treatment initiation. The respective PHC will have maintained the record of the screened individuals who came for confirmation, which was not accessed in this study. Follow-up of all the individuals screened positive for diabetes and hypertension was being done at all the 36 subcenters, as well as the data recording and reporting was 100%, while the reporting was done monthly in 34 (94.44%) subcenters, except 2 (5.56%) who were doing it weekly. In the subcenters with vacant ANM post, another ANM from another subcenter belonging to the same PHC was deputed as in-charge, to carry out the activities of conducting NCD camps under NPCDCS with the help of the MHW. Furthermore, the ANMs had difficulty in keeping a check on repeaters at the NCD camps. Among the 36 ANMs interviewed, 25 (69.44%) of them had received training for NPCDCS, while 11 (30.56%) of them had not received training for the same [Graph 5]. All the 36 (100%) subcenters had NPCDCS register, BP apparatus, glucometer, and glucometer strips, whereas availability of stethoscope and weighing scale was seen in 34 (94.44%) subcenters, Information, Education and Communication (IEC) materials were available in 30 (83.33%) subcenters, stadiometer was available in 28 (77.78%) subcenters, and only 7 (19.44%) of subcenters had referral cards specific for NPCDCS [Table 2]. The parameters of the individuals such as height, weight, BP, and blood sugar were checked in all the 36 (100%) subcenters. The BMI was calculated, and other risk factors such as history of tobacco consumption/smoking were inquired in all the 36 (100%) subcenters, history of alcohol consumption was gathered in 34 (94.44%) subcenters, and history of precancerous lesions was checked in 25 (69.44%) of the subcenters [Table 3]. “Periodic training is necessary for the health-care staff to provide better health care to the community,” was the opinion given by three of the respondents. In this study, the selected 36 subcenters covered a mean population of 6909 ± 1836, which was slightly more than the requirement as per the revised IPHS guidelines of 2012, where ideal population served by a subcenter was 5000. 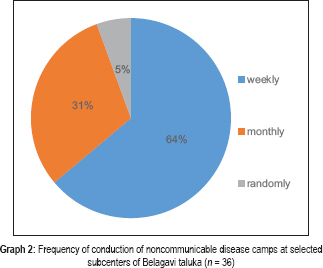 More than half of the subcenter staff were conducting the NCD camps weekly (63.89%), followed by monthly (30.56%) and few were conducting randomly (5.55%), though there were no guidelines from the national and state NCD cell for frequency of conduction of the NCD camps at subcenters; the Belagavi district NPCDCS coordinators had set the guidelines to conduct the NCD camps weekly, which was not being practiced at all subcenters. 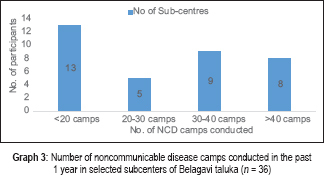 As per the instructions by the Belagavi district coordinators for NPCDCS of conducting NCD camps weekly, it accounted to 52 camps per year, while in the present study, it was observed that 13 (37%) of the subcenters were conducting the NCD camps <20/year and only 8 (22.8%) of them were conducting the NCD camps more than 40/year. 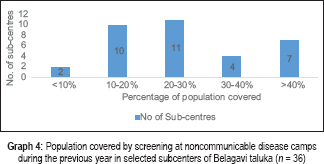 As per the Operational guidelines of NPCDCS, each subcenter is supposed to screen 40% population for NCDs in a year, but in the present study, it was noted that only 11 (32%) subcenters covered a population of 40% or more and, on an average, the population screened across all 36 subcenters was only 24.2%. In the present study, the population screened for diabetes, hypertension, or both was 64,096 out of which 3124 of the individuals aged 30 years and above were screened positive for diabetes, with prevalence being 4.87%, which was less compared to the global prevalence of diabetes of 8.5% among individuals aged 18 years and above as per the WHO in 2014. According to the study conducted in 15 states of India (ICMR-INDIAB) published in 2017, the prevalence of diabetes in India was seen to be 7.3%, while in rural areas, it was 5.2%, which was a similar finding compared to our study. In a study conducted in rural parts of Hubballi of Karnataka in 2016, it was reported that the prevalence of diabetes was 22%, which was quite high compared to the present study. In the present study, out of the screened 64,096 individuals, 3196 individuals aged 30 years and above were screened positive for hypertension, with prevalence being 4.99%, which was very less compared to the global prevalence of hypertension of 22% among individuals aged 18 years and above as per the WHO in 2014. According to the NFHS-4 reports of India, the prevalence of hypertension for Indians aged 15 years and above was 12.9% and, in Karnataka, it was 14.15%, which was comparatively very high compared to the present study, which may be also due to screened individuals being 15 years and above, contrary to the present study which screened individuals aged 30 years and above. A study conducted in Maharashtra on 280 adults aged 18 years and above in 2016 reported that the prevalence of hypertension was 26.8%, which was very high compared to the present study results. In the present study, 25 (69.44%) ANMs had received training for NPCDCS out of the selected 36 subcenters and the remaining 11 (30.56%) had not received training for the same, and a similar response was reported in a qualitative study conducted in Udupi district of Karnataka in 2017 that many of their participants opined they had low awareness toward NPCDCS, and a health worker had stated that, after an initial training, there were no further training program. In a study conducted in Surendranagar district of Gujarat in 2015, the authors reported that, out of the ten subcenters evaluated, only data monitoring and referral services were being done in all subcenters (100%), but the supply of IEC materials and screening activities was carried out in only 20% of the subcenters, which was quite low when compared to the present study. In conducting this study, seeking permission from the higher authorities was a difficult task, also convincing the medical officers and ANMs as they feared to share their data related to the NPCDCS. NCD screening camps were being conducted at all selected subcenters, but not up to the requirement as per guidelines, and only 69% of ANMs had received training for NPCDCS and the necessary equipment and IEC/health education materials were available at subcenters for conduction of NCD camps. Follow-up treatment services for screened beneficiaries who will be attending the further NCD camps at subcenters under NPCDCS must be made available at subcenters for better compliance and follow-up. Tracking system for the repeaters at the NCD camps must be thought of to avoid duplication of the data. The authors would like to thank the district health officer and district surveillance officer of Belagavi district, medical officer of PHCs, and ANMs of selected subcenters. World Health Organization. Global Status Report on Non-Communicable Diseases. World Health Organization; 2014. Available from: http://www.who.int/nmh/publications/ncd-status-report-2014/en/. [Last accessed on 2016 Aug 27]. Directorate General of Health Services, MOHFW, Government of India, National Programme for Prevention and Control of Cancer, Diabetes, Cardiovascular Diseases and Stroke (NPCDCS), Operational Guidelines (Revised: 2013-17); 2013. Available from: https://www.karnataka.gov.in/hfw/nhm/Documents/NPCDCS%20Final%20Operational%20Guidelines.pdf. [Last accessed on 2016 Aug 23]. Government of India, MOHFW, National Family Health Survey (NFHS-4) 2015-16, India Report; December 2017. Available from: http://www.rchiips.org/NFHS/NFHS-4Reports/India.pdf. [Last accessed on 2018 Jun 28]. Government of India, MOHFW, National Family Health Survey (NFHS-4) 2015-16, State Fact Sheet – Karnataka. Available form: http://www.rchiips.org/nfhs/pdf/NFHS4/KA_FactSheet.pdf. [Last accessed on 2018 Jun 28]. Government of India, MOHFW, National Family Health Survey (NFHS-4) 2015-16, District Fact Sheet, Belgaum, Karnataka. Available from: http://www.rchiips.org/nfhs/FCTS/KA/KA_FactSheet_555_Belgaum.pdf. [Last accessed on 2018 Jun 28]. Amarchand R, Krishnan A, Saraf DS, Mathur P, Shukla DK, Nath LM, et al. Lessons for addressing noncommunicable diseases within a primary health-care system from the Ballabgarh project, India. WHO South East Asia J Public Health 2015;4:130-8. Srinath Reddy K. Working Paper no 104 on Prevention and Control of Non-Communicable Diseases: Status and Strategies, Indian Council for Research on International Economic Relations; July 2003. Available from: http://www.icrier.org/pdf/WP104.PDF. [Last accessed on 2018 Aug 27]. Ministry of Health and Family Welfare, Government of India, National Action Plan and Monitoring Framework for Prevention and Control of Noncommunicable Diseases (NCDs) in India, Developed through the WHO-Government of India, 2012-2013 Biennial Work Plan; 2012. Available from: https://www.mindbank.info/item/4882. [Last accessed on 2018 Jul 10]. Government of Karnataka, Health and Family Welfare, National Health Mission, NCDs. Available from: http://www.karnataka.gov.in/hfw/nhm/pages/ndcp_ncd_npcdcs.aspx. [Last accessed on 2018 Jul 10]. Director General of Health Services, Ministry of Health and Family Welfare, Government of India, Indian Public Health Standards (IPHS), Guidelines for Sub-Centers; Revised 2012. Available from: http://www.nhm.gov.in/images/pdf/guidelines/iphs/iphs-revised-guidlines-2012/sub-centers.pdf. [Last accessed on 2016 Aug 22]. World Health Organization. Diabetes, Fact-Sheet. World Health Organization; 15 November 2017. Available from: http://www.who.int/news-room/fact-sheets/detail/diabetes. [Last accessed on 2018 Aug 26]. Anjana RM, Deepa M, Pradeepa R, Mahanta J, Narain K, Das HK, et al. Prevalence of diabetes and prediabetes in 15 states of India: Results from the ICMR-INDIAB population-based cross-sectional study. Lancet Diabetes Endocrinol 2017;5:585-96. Jahagirdar SS, Bant DD, Bathija GV. 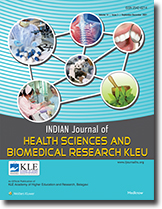 Study of prevalence of diabetes mellitus in the rural areas of Hubli, Karnataka, India. Int J Community Med Public Health 2017;4:104-9. Available from: http://www.ijcmph.com/index.php/ijcmph/article/download/20/284. [Last accessed on 2018 Sep 24]. Joshi MP, Puri MA, Ausvi SM, Saoji AV. Wide gap between knowledge and practices: A cause of concern for high prevalence of hypertension among lower socioeconomic class among urban slum population. Int J Community Med Public Health 2018;5:2858-64. Available from: http://www.ijcmph.com/index.php/ijcmph/article/view/2901. [Last accessed on 2018 Jul 10]. Ainapure K, Sumit K, Pattanshetty SM. 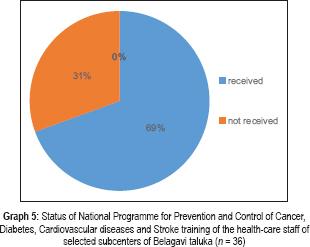 A study on implementation of national programme for prevention and control of cancer, diabetes, cardiovascular diseases and stroke in Udupi district, Karnataka. Int J Community Med Public Health 2018;5:2384-7. Available from: http://www.ijcmph.com/index.php/ijcmph/article/viewFile/2858/2094. [Last accessed on 2018 Aug 13]. Jasani P, Nimavat J, Joshi J, Jadeja Y, Kartha G. A study on evaluation of non-communicable disease control programme in Surendranagar district. Int J Sci Res 2015;4:685-8. Available from: https://www.ijsr.net/archive/v4i3/SUB152043.pdf. [Last accessed on 2018 Aug 16].